Asheville was the first Bee City! 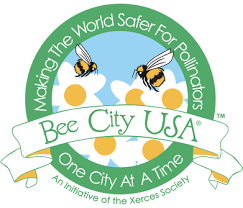 Named in 2012, today there are 70 designated Bee Cities in the United States. There are more beekeepers in North Carolina in North Carolina than anywhere else in the country, and Asheville has the most per capita in the state. Want to explore more about Bee City? OPEN MON-THU 11-6 ~ FRI-SAT 11-7 ~ SUN 12-5. 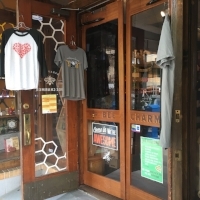 Start you exploration of Bee City downtown, at the Bee Charmer. They sell many types of honey, all raw and unpasteurized, and local varieties including sourwood, the world’s tastiest. 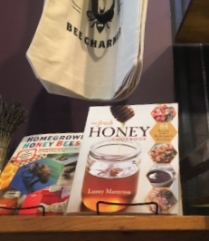 There is a honey tasting bar, and they also sell skincare, apparel, jewelry, kitchen accessories and cookbooks, including the Asheville Bee Charmer Cookbook. 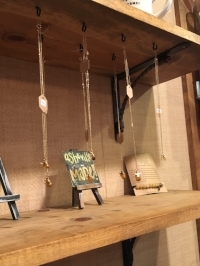 Honey and the Hive offers a wide variety of quality beekeeping equipment for new and seasoned beekeepers, along with Southern Appalachian honey and beeswax, and handmade jewelry, candles, and salves from local artisans. They stock the most extensive array of beekeeping supplies in the Asheville area: you can buy an entire hive kit, and a colony of bees, including the Queen! The Renaissance Hotel downtown Asheville has a bee hotel on top, hosting approximately 70,000 bees in their two hives, which guests can view from multiple places. Open 9am-9pm Sunday-Thursday, and 9am-10pm Friday and Saturday. Each lunch at one of Asheville’s most iconic restaurants, Tupelo Honey, where your meal will begin with biscuits drizzled with honey (careful not to fill up on biscuits, the food is really good too!). Now with 15 restaurants across the country, the flagship in downtown Asheville, open since 2000, has recently expanded with a new bar area; stop in and try the Tupelo Honey Margarita with house-made honey liqueur and snack on some of their famous Honey Dusted Fried Chicken. There are currently 46 Bee Campuses across the USA, and UNC Asheville was the 8th, designated in 2016. In order to help pollinators the campus has built a Bee Hotel, located in the main pollinator garden of the campus, and they have also made 30 acres of the campus (96%!) pesticide free. While visiting UNC Asheville you can also explore the nearby Botanical Gardens - one of the many Asheville Gardens keeping the bees buzzing. Every June the area celebrates Pollinators, the festivities revolving around National Pollinator week. This past year the Sierra Nevada Tailgate Market also celebrated pollinators at their market every Tuesday in June, and the Cradle of Forestry hosted a bug day with activities for kids that celebrated pollinators and explored their importance in the environment. 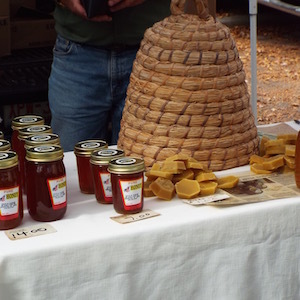 Every August for over 40 years Black Mountain has been celebrating Sourwood honey with its annual festival. Now over 30,000 people from all over the United States visit downtown Black Mountain for music, dancing, arts & crafts, food, and plenty of kids activities including rides, games and face painting. They host 200 vendors with arts and crafts, food and sweet treats, bee demos, and lots of honey! What’s the deal with Sourwood Honey? Sourwood honey is considered by many, including world honey experts, to be the best tasting. The complex sweet flavor is floral and light with hints of baking spices and anise. Getting pure sourwood honey is complicated - the sourwood trees, also know as sorrel, Appalachian lily, or lily of the valley tree, only grow in the forests from Southern Pennsylvania to Northern George, with the most abundance of the trees in the mountains of North Georgia and Western North Carolina. The bloom period is brief - the white bell-shaped flowers hang in clusters 5-6 inches long and bloom in late June through July. The beekeepers have to ensure the bees don’t collect from other trees, like Sumac, or Tulip Poplar and if the honey has even a small percentage of other varietals it can’t be categorized as sourwood. Sourwood honey has won best honey in the world twice, and is often in short supply not only because of demand, but also because of the effects rain and other factors can have on production. Mead is wine made from fermented honey, sometimes with added herbs and/or fruit. Mead is the oldest type of alcohol and has been present in many cultures throughout the world and throughout history. There are multiple Mead makers in WNC. Open Monday, Wednesday and Thursday 2pm-8pm, Friday and Saturday 1pm-9pm and Sunday 1pm-8pm. Opened in 2007, Fox Hill Mead is located 20 minutes north of Asheville. Visit their website to arrange a free tour and tasting! If you haven’t already bought and tasted enough honey, one of the best places to buy local honey is a farmers market - there are many to choose from, depending on the day of the week. Buncombe County Beekeepers Chapter offers resources for local beekeepers, and people who think they have a swarm. Written by Laurey Masterton, who ran what became an iconic cafe and catering company in downtown Asheville. Laurey's began in 1987, before Asheville was on the map as a popular destination, and survived many ups and downs along with its owner, who died in 2014 after battled cancer 3 times. Masterton was not only a cook, but also long distance biker who raised tens of thousands of dollars for AIDS and cancer awareness and treatment, and also a beekeeper. The Fresh Honey Cookbook: 84 recipes from a Beekeeper's Kitchen was published in 2013.